Includes skis, boots and poles. ​Located on the first floor of our lodge next to Guest Services, our rental department offers a wide variety of equipment for alpine and Nordic activities for ages 8 and up. Other services include ski & snowboard repair, tune-ups, binding adjustment and hot wax. We stock the latest ski and snowboard equipment, including high performance demo skis and boards from Arbor, Atomic, Burton, Volkl and Rossignol. Let our professional and friendly staff help you find the right gear and a custom fit. All rental gear subject to availability and stock on hand. ​Our Express Rental Program makes renting a breeze at Willamette Pass Resort. Sign up your first day at the mountain and each day after, simply E-mail us rentals@willamettepass.com by 1pm the day before your visit and your equipment will be ready for you. Our staff will select your equipment, process your rental, lift ticket, or lesson transaction and have it waiting at the slopes. Express Rental reservations must be cancelled by 1pm the day prior to usage. No refunds. Ski rental equipment is available in sizes child 1 to adult 15 for boots and 80 cm and up for skis. Snowboard equipment ranges from 96cm to 165cm, and boots from size 1 to 15. We are closed for the season. Please join us again next fall. Thank you for skiing and snowboarding with us! SKI IT, RIDE IT, LIVE IT! LIFTS: 1 six person detachable, 3 triple chair lifts, 1 Magic Carpet. Lift Capacity: 9300 skiers per hour. Steepest Run: R.T.S. - up to 52 degrees. Celebrating over 75 Seasons here at the Pass! ​Willamette Pass Ski Area officially opened in 1941 with a handful of rope tows. Roy and Edra Temple were the ski area's first owners, followed by George Korn who owned and operated the ski area for more than twenty-five years. The ski area was later owned by several ownership groups, each bringing new improvements to the ski area, like the Poma Lift which was installed in the mid 1950s. In 1982 the ski area was purchased by the Wiper family who still owns and operates the ski area today. The family quickly modernized the ski area by installing a Summit Lift. Over the years we have seen major improvements: The Ski Lodge, the Twilight Triple Chair, The Sleepy Hollow Lift, the Peak 2 Lift and the state's first high speed detachable six passenger lift, which replaced the Summit Lift. Today Willamette Pass has four chairlifts and one surface lift which serve 555 acres and a vertical drop of 1,563 feet. The 2018/19 Season has concluded. Additionally, NFC payments (Apple Pay, Google Pay, etc.) are available in our restaurant and lounge. Willamette Pass Resort does not accept cash, American Express, or personal checks. For customers without a credit or debit card, we recommend purchasing a Visa, Mastercard, or Discover branded reloadable gift card at the retail outlet of your choosing. There is No hiking, Sledding, Tubing or uphill traffic allowed within the Resort Boundary. Daily e-Store tickets available now. Our Professional Ski and Snowboard Instructors are certified and trained to provide a great, safe and fun learning experience. We want to make the process of reserving ski or snowboard lesson(s) as easy as possible. Lessons fill up fast, so please make reservations at least 24 hours ahead of time for weekday lessons and 48 hours ahead for weekend or holiday lessons. Reservations will be confirmed by email. Emails are returned in the order they are received and we do our best to reply in a timely manner, but please note that if you have not received a reply, you do not have a reservation. Cancellations must be made at least 24 hours in advance. Reservations may be made by contacting us at lessons@willamettepass.com. 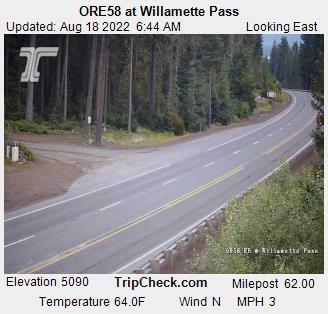 Willamette Pass Resort is located at milepost 62, highway 58.